The other day we saw a gruesome display of Bambi meeting a Chevy Trailblazer at speed, and now oilburner ups the ante with a Ford F-350 SuperDuty taking down a horse. It's NOT-AT-ALL-SAFE-FOR-WORK! 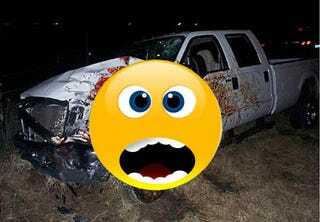 According to our sources, this was the result of an F-350 Super Duty minding his own business, driving along at 50 MPH on a dark night, who came across a darkly-colored horse crossing the road. The damage is pretty extensive with horse bits all over in what remains of the truck. What a mess. Horse sashimi anyone?